We do dressing differently in the south. Dressing is moist and delicious, served steaming with sides of cranberry sauce and ample amounts of chicken or turkey inside. 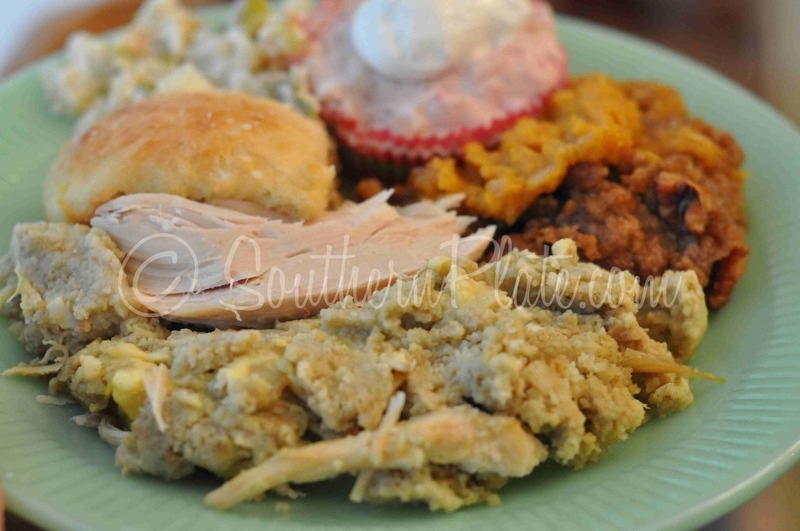 Often reserved for holidays, my grandmother changed all of that with her crock pot chicken and dressing recipe. Now we have this family favorite all year long thanks to the little effort involved in preparing it. I’ve often said there is no sight prettier than an old lady with a casserole dish – but the sight of my Grandmother toting her crock pot has it beat by far! This is from my grandmother, Lucille, to you. Enjoy! You are going to need…TWO pans of cornbread (I know I am only showing one here, but trust me, two, two..), Two hotdog or hamburger buns, two boiled eggs, stick of butter, chicken (I used 4 boneless skinless breasts and just boiled them in water until done), two cans cream of chicken soup, two cans chicken broth, sage, and a chopped onion. Uh oh! Here goes my tangent….. Eons ago (A few years), I was watching the Martha Stewart show and Donald Trump and his new young thang were on there. The newly acquired Mrs. Trump had come to demonstrate how she makes meatloaf. Who are we kidding here, if you were married to “The Donald” would you make meatloaf? Anyway, lest we actually think she had done this before, she requested a latex glove (which she pronounced “Lah-tex”) before handling the meat. The following segment was perhaps the most riveting food show segment of all time. A super model attempting to smoosh ground beef for the first time. Okay, so my point is this, Mrs. Trump was too good to touch ground beef with her bare hands and you know what? I think she was on to something. I think all of us, no matter what station in life or how little money we have, should all choose something and declare ourselves too good to do that. Its just a state of mind really. I mean, load your dishwasher and tell yourself in a diva-esque tone “I’m too good to hand wash dishes.” See how it feels, really. Me, I’m too good to chop onions ~grins~. Alright so…I’m too good to chop onions when the grocery store has the frozen ones in stock but still – at times I am too good to do something and it makes me feel rather indulgent and as close to being a princess as I am likely ever to come. Alright! Things are heating up here at Southern Plate! We now have ACTION Photography!!! Crumble all of your cornbread into a large bowl. I will be posting a cornbread tutorial later in the week. My mother said she is going to do it because I use whole milk instead of buttermilk when I make it ~dramatic gasp followed by a giggle~. Tear hot dog or hamburger bun into small pieces and place in bowl. We always use two types of bread in our dressing. The white bread helps to bind it together. If you don’t have any buns, you can always use loaf bread. …one cream of chicken soup and both cans of broth. Stir well until it looks like this. You’ve made your dressing!!! Go you!!! In crock pot, spread half of the remaining can of cream of chicken soup. Top with 1/3 of your dressing. Repeat with another layer of dressing, remainder of chicken, and a final layer of dressing. Spread remainder of cream of chicken soup over the top. Cover and cook on low for three to four hours. In a large bowl, mix together cornbread, buns, sage, onion, eggs (chopped), melted butter, one can cream of chicken soup, two cans broth. This is your dressing mixture. Spread half the remaining can of cream of chicken soup in the bottom of a large crock pot. Top with 1/3 of the dressing. Top dressing with half of the chicken, shredding it as you put it in. Top with 1/3 dressing, remaining chicken, and remaining dressing. Spread other half of cream of chicken soup over top. Cover and cook on low for three to four hours. Serve hot. You might also enjoy my quick chicken and dumplings recipe! I cant wait to try this recipe. My two loves cornbread dressing and my crockpot. I swear i wear that thing out in the summer its just to hot to turn on the stove in the Texas heat. We to eat cornbread dressing year round I love that stuff. I will definitly be trying out this recipe. I have heard of crockpot dressing I just havent made it yet. Thanks for sharing. I am the exact same way! I’ve lived in Alabama all of my life and I swear it is TOO HOT to use the oven in the summer unless you have to!!! The crock pot is a summer lifesaver in the south, without heating up the house any more than it already is! Hope you like this! I love anything I can toss in the crock pot in the morning and call supper in the evening! Just wondering why there is no celery in this recipe. It’s sounds so good I can’t wait to try it! That looks delicious! I love dressing, whether it’s cornbread dressing or regular dressing (I’m not from the south, so to me the kind that isn’t cornbread is “regular”) – and I love the idea of having it on a regular night instead of waiting until Thanksgiving, or even until Fall. Thanks for the recipe! Oh, and my husband was intrigued at the idea of chocolate gravy for biscuits. I have the feeling that we will be trying that one very soon. I think that one of the best things that I have done for my wife’s family here in the frozen northeast is to introduce them to the joys of cornbread dressing for Thanksgiving. My grandmother is long away from this earth, but I will remember her every time I smell cornbread in the oven. I would love to see a recipe for northern dressing sometime if you have one! You know, I’ve only been out of the south twice! I went to Canada once and D.C. once! Corey: I know just what you mean. Lela (my great grandmother) was always the one who made the dressing in our family for Thanksgiving. Every time I make it I can see her standing at the counter, humming to herself as she stirred up the cornbread. The smell of sage reminds me of her, too. One of the things I enjoy more than anything is sharing a cherished family recipe with someone who has never tried it and seeing their face light up at the first bite. Holy Mackeral! You KNOW I’m making this one this week! Every time I sign on I find another yummy recipe! This email is from Terri… even though is says annonymous. I can’t remember my password! Anyway… any recipe that keeps me out of the kitchen, whether it be hot or cold outside… I’M IN! Thanks so much! YAY Terri! I hope you like it as much as I do! I am going to have to post some more crock pot recipes soon as it seems we are all using it as a survival mechanism during the sweltering summer! Husband is complaining that he needs to get to his blog…its so funny seeing all of us out of town and fighting over the internet connection! Teri, don’t you worry one bit. There is no such thing as a silly question and I will never think you a weenie! Honestly, I do this the easiest way possible. If cornbread were available ready made where I am, I wouldn’t think twice about using it. I doubled that recipe (which is straight from the package of Martha White), mixed it all together, popped it into two greased eight inch round cake pans and baked it at 450 for twenty minutes or so. HOWEVER, I frequently use Jiffy Corn Muffin mix. Two boxes of that and I believe all you add is an egg and some water, I don’t have a box on hand to check but I know it is super easy. Just put that in your cake pans same as I did above and bake it. What you are going for here in the long haul is about two quarts of corn bread once you break it up. Personally, I would go about getting it the easiest way possible! Hope that answers your question! I know I was a little long winded…. the receipe for cornbread is great, but I find that using about 3tlb.sugar adds a punch that makes the cornbread delicious.Also, if you make good cornbread, that makes the dressing taste even better. Most people use the crock pot so that dinner will be ready when they get home from a hard day’s work. But how can you do that when the recipe says to cook for 3-4 hours? I can’t come home at lunch time to start it or unplug it. Thanks! Also, I have a recipe that is layered like this one with chicken and stuffing but the bottom layer is green beans. You could add those to this one too I bet. Here is what my mother used to do when she was a working gal! In the morning, you are so busy getting ready for work that you really don’t have time to get this together. What you do instead is make all of this the night before and go ahead and get it assembled in your crock pot bowl. Place it in the refrigerator overnight. Stick the bowl in your crock pot base right before you leave for work and put it on low. You can then cook it all day and it will be ready when you get home. I usually leave my crock pot on low for several hours after this is done anyway, with the leftover dressing in it so I can nibble here and there until I put whats left in the fridge. I found a handy little timer gadget at Wally World. It plugs into the wall, and my crock pot plugs into the timer. That could be another option for working moms – – just prepare your crock pot the night before, then before you leave for work place the cold pot in the cooker and let the timer do it’s job, so long as you set it to begin cooking less than 2 hours after you’ve pulled it out of the fridge. Tish, on the green beans.. I FINALLY MADE THIS! It was sooo good…! Thanks for posting this! I’d like to officially request more crock pot recipes! 😀 This was so easy and good. I assembled it in the crock pot, turned it on, went to church and VOILA! When I got home our lunch was ready! So good! THANKS! OH.. and just so you know.. my sister Treva YUCKED the Jiffy corn bread dressing that I made.. She was sooo wrong! It was yummy! My mom thinks the jiffy cornbread thing is a travesty as well. Oh well, its a new day and we have things to do!! I will definitely open up ye olde family cookbook and try to get more crock pot recipes up soon. We have several of them! Now you are making me want some…. 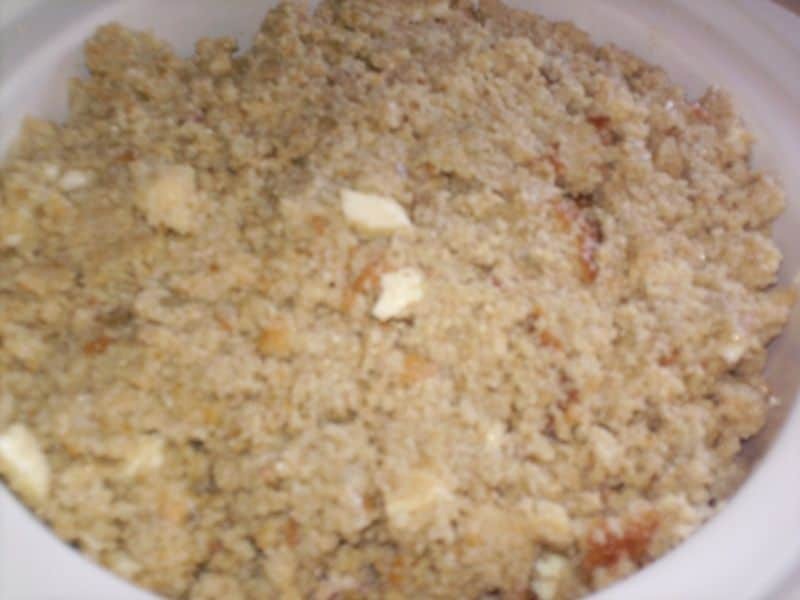 Wonder if you could just use the P. Farm cornbread stuffing that is already made? Do you mean a stuffing that is already prepared or a dry mix? Just curious. We just have the dry mix. I think you could use the dry mix as long as you go ahead and prepare it according to the package directions as it is dryer than fresh cornbread. If your stuffing seems to have too much moisture, just leave the lid off for half an hour or so before serving. Keep in mind that I’ve never tried this but I think it would work. I am so glad to see this recipe on here! My husband’s granny has been making crockpot dressing for years and it is magnificent =0) Any time I have to bring a dish for a holiday, that is what I bring and people rave over it. You can also use the premade bags of pepperidge farm cornbread stuffing instead of pans of cornbread but it can be hard to find except around the holidays. Oh my! I tried this today, and now I’m stuffed! Somehow, I never learned to make dressing, and this was a real treat for us, especially for a non-holiday meal. It makes a LOT, so I shared with my (grown) children, and hubby and I still have leftovers for tomorrow. For once, DH is really looking forward to leftovers! Thanks for posting – I’ve decided to make this for Thanksgiving as well. Could you please tell me if this recipe can be adapted to cook in the regular oven instead of the Crock Pot? Thank you! This is a wonderful recipe!! My family wants just dressing for Thanksgiving and I was wondering if you could make this without the chicken or would it be too mushy? Thanks. Jackie: You can absolutely make it without the chicken and it won’t change it a bit, go for it! I’ve made it that way many times! How many servings does this recipe yield? Thanks for this recipe! I’ll be making it for this Thanksgiving! I can’t wait to try this. I have “sinned” I have bought dressing in the past. I think this might just be the ticket. Cheryl Hey to a fellow Alabama gal!!! Hope you enjoy it, be sure to let me know!!! Have you placed this in the Oven Long enough to brown on top? Nope, but you sure can!!! Let me know how it turns out, shirley, I’m sure it will be great! [I posted the following message on your cornbread post, but I wanted to make sure everyone knew how great your/your grandmother’s dressing recipe was!] I made two batches of the Dixie cornbread for this recipe for Thanksgiving! EVERYTHING WAS A SUCCESS!! The next day my aunt even asked me for your website so that she could make the dressing. Also, my other aunt was so crazy about the dressing that she didn’t want to share it with the rest of the family LOL! This was my first time making turkey and dressing for Thanksgiving. Thank you so much for being a part of a successful Thanksgiving dinner :D.